Golf is easier than you think. It’s harder when you are thinking too much and playing nothing. In golf, you get ample time to set yourself and make that perfect swing. There is no counter attack to fear. The theoretical part of golf will only get you so far but playing in real match conditions will make you a pro. But having a sound knowledge of shot making will help you to speed up your learning curve. Good golfers know how to play and they also know how things work. For perfecting your shot making we have compiled an ultimate guide that can help you hit with drivers and irons. By the end of the article you will get a detailed insight on how certain shots work and what you need to do. Slicing from the tee: How to solve this? Hitting the ball straight: Why you should avoid this? Athletic balanced position.. Mmm. You have heard of that once or twice or many times. Whatever your height might be but there are a few things in golf that remain same for all. We have found the best steps to gain that athletic balanced position. Stand straight with your arms placed freely to your sides. Now, your feet should have a firm grip on the ground. The critical part here is the width between your feet. The feet should either placed in alignment with your hip or shoulder. The athletic balanced position will depend on this width. You make it wider or smaller, you can lose this balance. Your knees must be flexible in that bent position. If you record yourself, you should be able to see an angle forming between your hips and the spine. The balance again will depend on your comfort zone. You can bend a little more forward or lean back a little, but you should feel that balance and control in your stance. There should be a balance of flex. More or less and you can lose control of your shots. Now the final part is with the hands. In this inclined position, run your hands straight down. Now, if you hold your golf club, you’re hands should be under your chin. How to check that athletic balanced position now? In this bent position, your shoulder should be over your toes, and your knees must be over your laces. And if you do all the steps correctly, you should be able to gain that balanced position. Want to develop an expert level standing position? We got this covered too. So, you a front foot and trail foot is all you got. You can make your shots easier with an anti-clockwise movement of your front foot towards your target. In this way, you have less stress on your front knee. Now let’s talk about your trail foot. This foot should have a clockwise movement away from your target. If you get this movement right, you will have greater mobility during your shots. If you are hitting with a well-balanced position, but you don’t know where your target is, you will have a hard time scoring. Let’s, get this straight. Your shoulders, hips, knees, and feet should be placed parallelly to your target. The chances of miss-hits will be minimized with this tactic. Plan your shots and make yourself as best as possible to be in alignment with your target. Is it different to hit with a driver? What do we have to do to get those awesome driver shots? Anyone hitting from the tee has an added advantage. This is the only position in golf where the ball is already in the air. But you need to tee up the golf ball properly. If the ball is lower or higher than your golf club, you will lose some leverage. The ball should be placed in such a way that it is not lower than the clubface center and not higher than the top of the golf club. Ah! So, you might wonder why do we have to use a tee at all? The reason is just that of the lower loft of drivers. Without using a tee, you cannot get the ball high in the air. And that’s also a reason you cannot use drivers outside the tee box. Use the instruction we mentioned in the first section of this guide. Now you can adjust the ball position between your feet. The ball should be placed in front of your stance, a little forward. This is because of the extended length of the driver. So, placing the ball forward will help you make good contact. Your body should be in such a position that the golf ball along with the tee is near your lead foot. We have seen beginners keeping the ball near the back foot. This is a wrong position and will give you hard times getting the ball in the air. If you hit hard, but your shots are moving everywhere, then there’s no point practicing. A little adjustment of the grip will help you achieve more accuracy. For this, you need your lead hand and the club to be at a straight line when hitting the ball. This means the ball, club, and your lead shoulder are in a straight line and that can help you hit very straight. Now that the alignment is right you can add a little tilt to your lead shoulder. The tilt means that your trail shoulder should be lower than your lead shoulder. That 300-yard shot will become more comfortable with this tilt. You can practice it by pouring some water on your lead shoulder. If it drains down to your trail shoulder, then you have created that tilt successfully. Slicing a tee shot is a very common problem golfers face. There is nothing to be frustrated. We got some pro tips for you. The slice usually happens for those who have their right shoulder too much out when swinging. So, the swing path narrows down and chances of slices become high. Your right shoulder should stay back and make the swing with a full turn. Chances of slices will drop in this way. There is also chances of a slice if your ball is too far from your body. So, when you have a swing, you tend to open up your shoulders and limit that turn. When the ball is placed at a comfortable distance from your body, a full shoulder turn will become easier for you. The chances of miss-hits will decrease. A complete turn of your body is necessary during your drive shots. Many players slow down at the point of contact. But due to the momentum that you already have tilts the club face towards left. So, you get slices. To simply solve this hit the ball with the full body swing without any interruption or slow down. Concentrate more on the body turn to hit rather than your hands. How to not hit everywhere? Proper arm speed is the key here. Here ‘Proper’ means a constant speed through the shot. Inconsistent speed through the shot will result in shots going everywhere. Some golfers have a stop before the contact, others speed up at that point. The swing must be uniform keeping your arm speed consistent throughout the shot. Practice this, and your shots will become more accurate. Hitting a golf ball with irons is not the same as hitting with drivers. You don’t have the advantage of using a tee to lift your ball up in the air. But sure you can develop your techniques to hit crisp shots whenever you want. You need to understand how the swing works in hitting with an iron. As the ball is on the ground now, you should have a low point of contact in your swing. Hitting with iron involves the clubhead touching the ground and then making contact with the ball. So, when you swing a circular motion is created, and as soon as the clubhead makes contact with the ground, it should be ready to contact the ball in that circular path. The ball should be placed as close as possible to the middle of your stance. Now, that low point of contact will be easier to gain. Now that you have the ball near to the middle of your stance, you are ready to have a big go at the ball. Your club, ball, and the lead hand should be in a straight line for the perfect iron shot. The ball position is also essential in this case. If the ball is too much deep in your stance, the angle with cut down and you will have less space for a good shot. Keep it too far forward, the angle increases and chances of miss-hit increases. Weight distribution can have a massive impact. You should have more than 50% of your body weight on your front foot. In this way, you have higher chances of hitting the ball with a low point of contact. Lean too far back and chances of hitting the turf first increases. You can hit all day with your club but what will make you stand out is the power you put through your shots. In golf, we call this ‘hinging.’ If you try to hit a nail with a hammer, you should be having a hinging or lever like movement which creates power. Similarly, in golf, when you swing the club, you don’t just move your body. Your arms should act as a lever to get that hinging motion that can give you power in your shots. A descending angle is what you get at the point of contact when you are hinging. And the ball is hit with maximum contact and power. You have made contact and should that be the end? A smooth finish will ensure that you have hit the ball correctly. A good finish involves weight shifted to the front foot and the club behind. The head and chest should be facing the target. You should be able to hold this position for some time, and that will mean you are in a balanced position and your body has rotated in full motion. What we have mentioned earlier on hitting with irons: hinging, low point and weight distribution, if you want to get this right, practice this drill. Get in the iron hit position we talked about. Maintain your weight on your front foot. Any movement backward will make your shot inaccurate. Practice the swing path you are gonna take. Use a 90-degree waist height technique. In this technique, your golf club when reaches the waist height makes a right angle with your lead hand. Now, make a full hinge, and you are ready for that shot. Here comes the drill. Draw a straight line without the ball in place. Swing the golf club and unhinge at the downswing and notice where your golf club is making contact. If the contact is on the line or in front, then you are doing good. If it is behind the line, keep practicing. Once you get a hold of it, practice with a ball. You are learning golf, and you must be joking if you don’t know who Johnny Miller is. Miller is a 25 PGA tour winner along with two majors. And that made him enlisted into the World Golf Hall of Fame. As a lead golf analyst in NBC sports, he has a deep insight into the game. Here are 8 practical pro tip from Miller that can impact your gameplay with the irons. Practicing with conventional techniques is good, but a lot of things during a play will defy conventional techniques. The more you play, the more you will learn shots that are out of the book. This is a life lesson that Miller learned while he played in the Olympic day in day out. Current golf equipment is full of innovative design and technicalities. Johnny Miller won 8 PGA tours with his 25-year-old Tommy Armour Iron. But when he switched to a newly developed golf club, he was not satisfied with the golf club’s performance. So, the life lesson Miller teaches us is that getting a hold on to the irons which you feel comfortable and know by the hand is crucial. On a single look or contact, new irons might feel great, but it can work completely different in playing conditions. Miller was a good listener of the golf ball shots. Whenever he would hit a ball, if he were seeing or not, he could tell if the ball struck on the toe or the middle. So, when you play, try to understand the sound of your shots and match them with your visualization. That can make you a better golfer day by day. Miller won the 1974 Tucson open only through controlling distance with his iron shots. He hit the flagstick like 10 times. Get a clear idea of the length and speed of your swing. And you can use that to control the distance your ball covers with irons. Hitting long and hard everytime can also become your weakness when you have to cover a short distance to hit that hole. Miller is a great observer of other players’ swing. Based on his observations and life lessons, he has encouraged to keep the head low during the swing. The knees should do this necessarily. Flexible knees bent and targeted towards the shot will help you to pure the shot absolutely. Good iron players always have their right wrist in a semi-cocked position. If you are swinging with the right palm facing up then it’s high you change it. 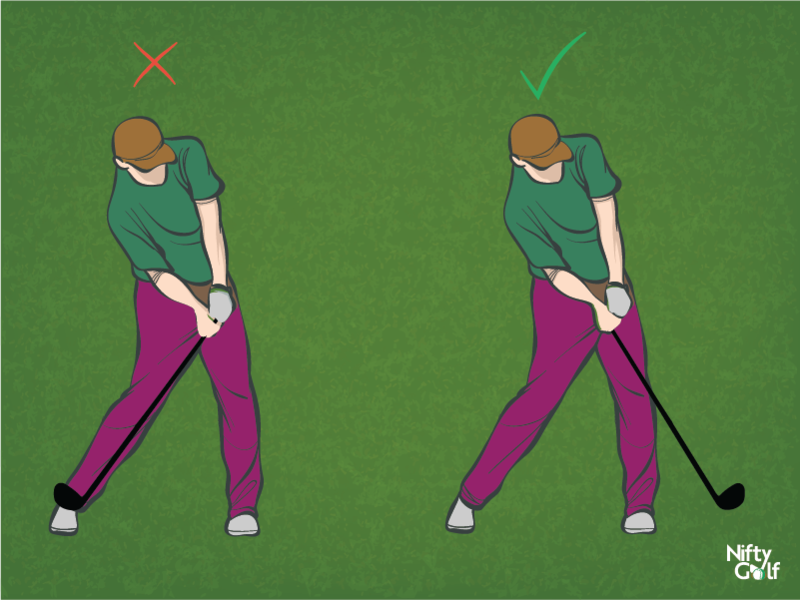 Right palm facing down in a semi-cocked position is the perfect way to play with the irons. Many golfers think over minute details while playing. And that can seriously impact their game. As playing with iron involves precision, golfers tend to lose focus on the basics and ponder after details like a wet club and light breeze and many more. What’s important is your alignment, feel and ball contact during the games. Small things will hardly affect when you get these 3 things right. Every time you a golf ball, try to capture the way it made the impact with the ball. Miller could, and it was one of his top secrets behind those 25 PGA tour wins. So every time you hit a ball and visualize the impact, you will know if you had hit a good one. Sometimes 300 yards coverage is not enough when you have more distance to cover. So, there is physics involved every part of golf. We will break it down for you in simple terms. We will not get into technical details but enough to let you know how things work. Let’s get straight the direction of your clubhead at the point of impact will control the course of the ball. If you twist your arm or wrist just slightly, you can change the direction of your clubhead. A 10-degree shift of the clubhead to the right of the ball means a 10-degree shift of the direction of the ball to the right. Two things are essential for getting a curvature on the ball. The degree of the clubface and the degree of the swing path. So, if you can get the clubface and swing path degrees equalling each other, you get perfectly straight shots. Two rods aligned 5-6 yards to each other should do the job. Now hit the golf ball and see what does the ball do. Does it go straight and if it does what happens after it lands. Adjusting the swing path and the where you hit the ball you can understand how you can curve the ball. What? Avoiding to hit the ball straight? It does seem very anti golfing tip, but the natural tendency is always to hit the ball in sideways with a curve. Experts believe that it’s more challenging to hit dead straight because of the alignment of specific things you need to have. And in playing conditions its not always possible to achieve that. Instead, if you can master the art of curving the ball, you can get in a far better position. You can either take either the right or the left direction of the curve to make your ball reach the destination. This is your natural shot-making. Hitting straight from the tee area is necessary, but with irons, in the fairways, you should develop and control your natural shot-making to take your game to the next level. Who doesn’t want to master the art of hitting low golf shots! It’s cool if you know how to do it! Bad weather and high wind? Hit the ball low and minimize the itz and bitz the ball does. When you lower the ball flight in the air, it has fewer chances of moving side to side. High wind can change the flight of the ball. Having this skill in your bag will yield better results. Step 1: Take the set up for iron hitting. The ball should be further back in your stance, 6-12 inches will be optimal. This will help in achieving that lower flight. 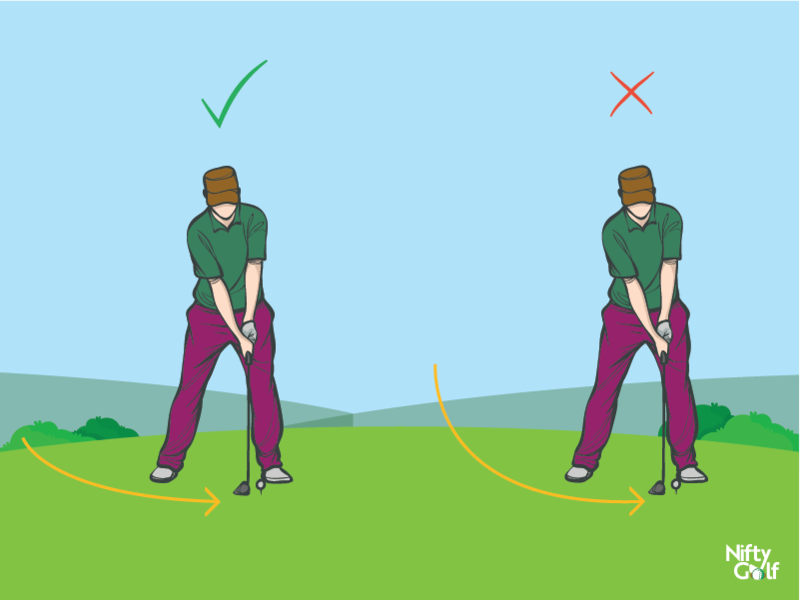 Step 2: The club handle should be in front of the ball. Step 3: The club handle and your lead arm must be in a right angle position. This step is very crucial. Step 4: The downswing should be made in such a way that you can unhinge at the very last moment. In this way, there will be very less loft on the ball. Step 5: Don’t make the full finish here. Finish at the waist height, and that should be it. The alignment rods will help you once again. This time use two rods to make a triangle. Start with a bigger triangle. As you begin to get a hold of your shots and understand how low you can hit, you can decrease the size of the triangle. It’s an easy way to master the art. The basics of hitting the golf ball high remain the same as hitting low. You just need to change a few things. Step 1: Take the same position for hitting with irons. The ball position is the key here. The further forward you have the ball in your stance, the higher the ball will go in the air. 6-12 inches will be optimal for this. Step 2: The lead arm and the club handle should be in line. The handle cannot be as forward as it was. Step 3: The right angle is important here as well. L shape between lead arm and the club. Step 4: The normal unhinging can do the job. This time you can unhinge a little earlier. Step 5: A full finish is mandatory here. The fuller your finish will be, the higher your shots will be. Just hitting high won’t do any good for you. It’s the control that you have on the height you want to achieve is the key. Take two alignment rods and place them 3 or 4 feet apart. Use ropes between them to create a ladder-like structure. Now you can practice your shots between these gaps for high, mid or low trajectory shots.